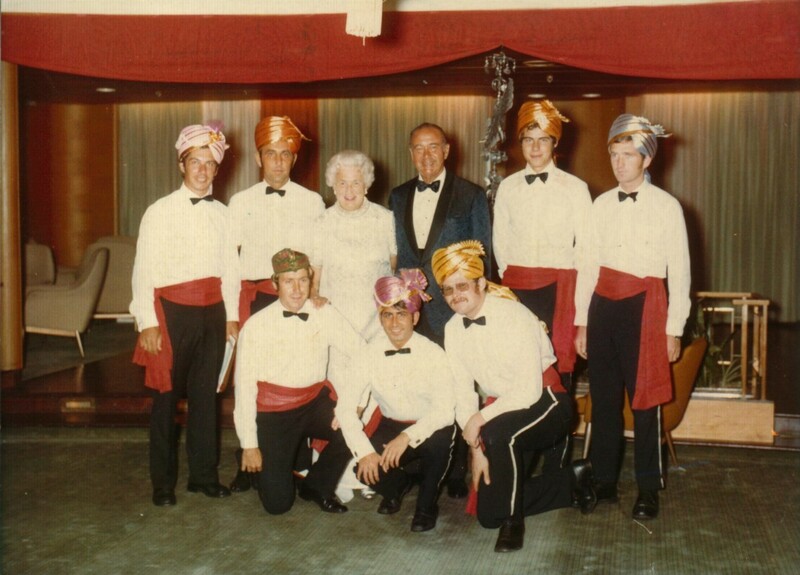 deck waiter and bar steward in 1973/75. Read Hasse's story from his years on the Kungsholm. Sultan style cocktail party 1972 in Aft Smoking Room, waiters dressed in turban and waist wraps. Standing from the left: Dining room waiter, Swedish deck waiter, passenger host couple, Hasse Gustafsson, dining room waiter. Kneeling: Two dining room waiters, deck waiter Ulrich from South Africa. 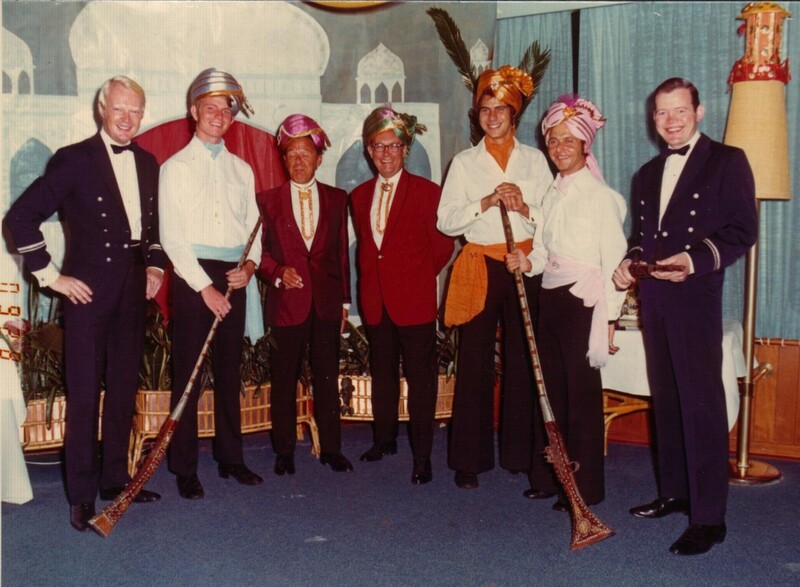 Taj Mahal party 1973 (although the Kungsholm did not visit India that year) in the Starboard Forward Verandah Lounge, waiters dressed in turban and waist wraps, holding decoy rifles. From the left: Ingwar ‘Snow White’ Gemzell, Tommy Stark, passenger host couple, Hasse Gustafsson, Per Uth, Rolf Mayer. 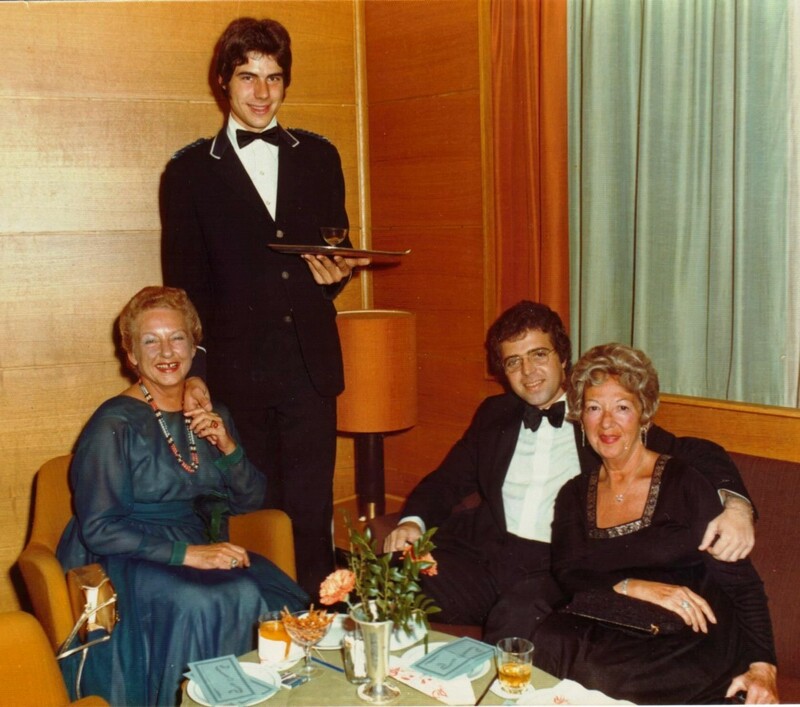 Hasse on duty as a deck waiter the first days of December 1972, serving drinks to passengers Curly and Irma, who were frequent repeaters aboard the Kungsholm, in the company of a Brazilian gemstone sales agent. Notice the Kungsholm song leaflets on the table. Curly grabbed Hasse’s hand for the photo, something that incited worries into the heads of Hasse’s mother and grandmother when they saw the photo. 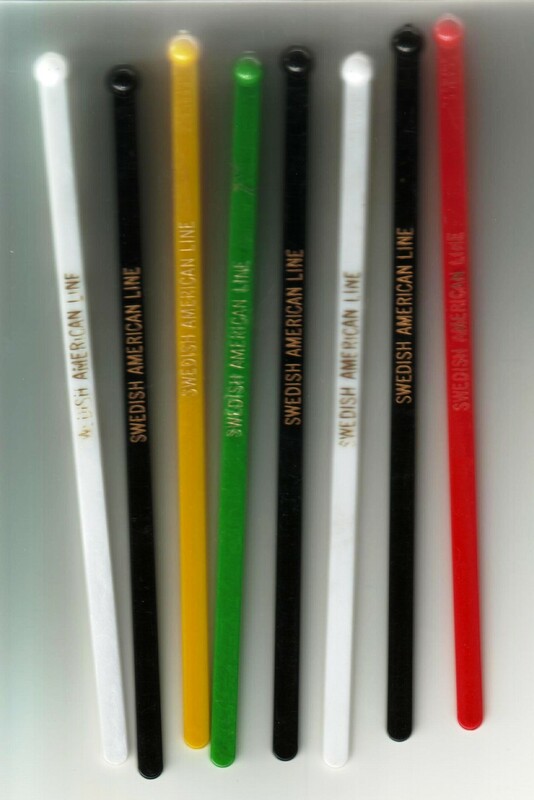 A selection of cocktail stirrers from the Kungsholm bars, used with most long drinks. Waiters also used the stirrers to separate similar-looking drinks on their tray while serving. 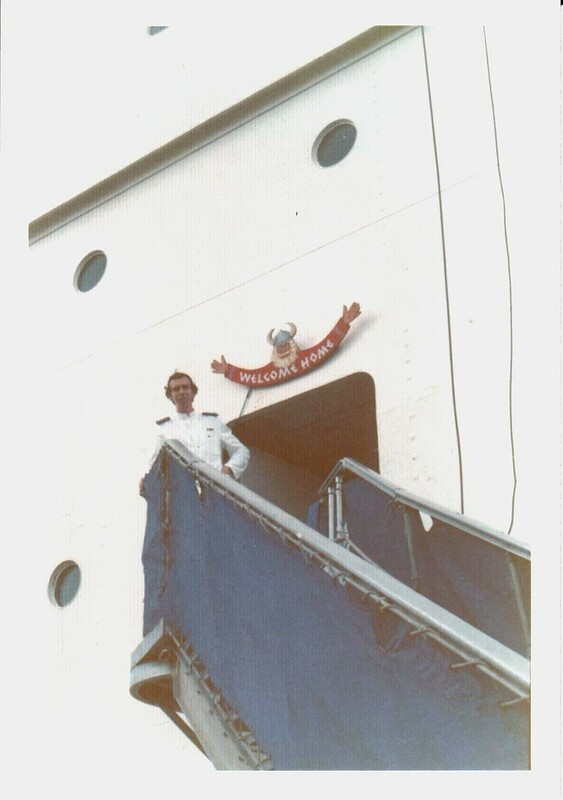 Deck waiter Åke Sandahl on duty as gangway watch, with the Viking welcome-home sign overhead. 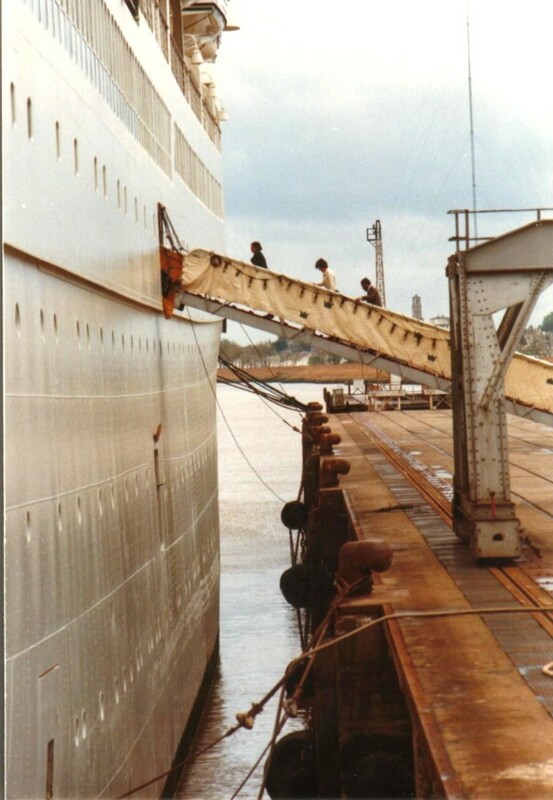 Deck waiters had a rotating schedule for gangway watch, staying 2-3 hours on each shift to encourage embarking and disembarking passengers to “watch your step, please”. We were repeatedly told that stumbling passengers who did not get that warning could sue the SAL for big money if they had an accident and an injury. At the pier end of the gangway in Panama, deck waiter Göran Stacke and an officer from the bridge stand by for receiving returning passengers from ashore. 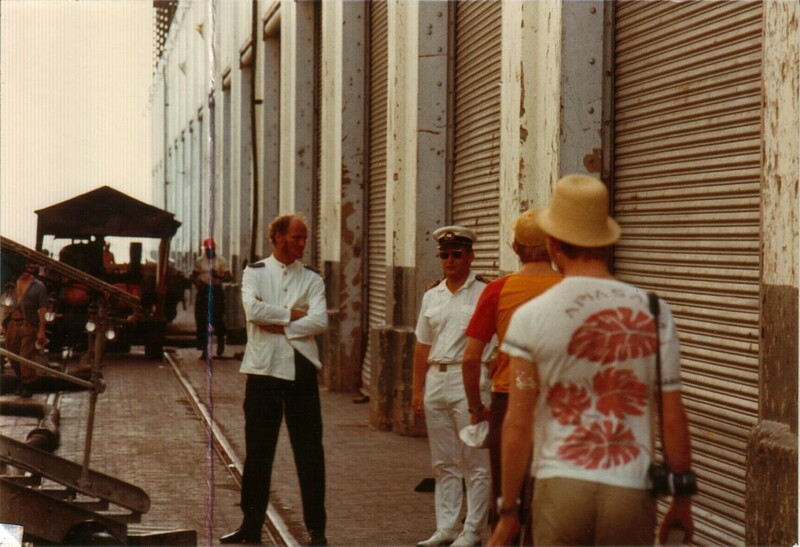 Two crew members return from a city walk, Jerry Jakobsson and Tommy Stark, with their backs to the camera. The ship’s bottom required a good scrubbing now and then to get rid of algae and barnacles that affect fuel economy and speed. 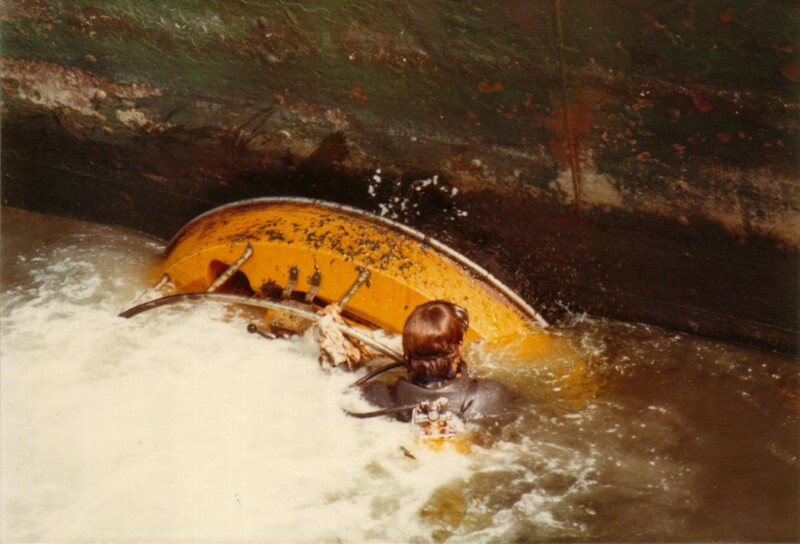 In Panama, divers were deployed to clean Kungsholm’s hull with special equipment. 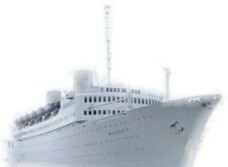 The white body of the Kungsholm was in continuous need of painting and repainting in order to stay white and shiny – an endless task. 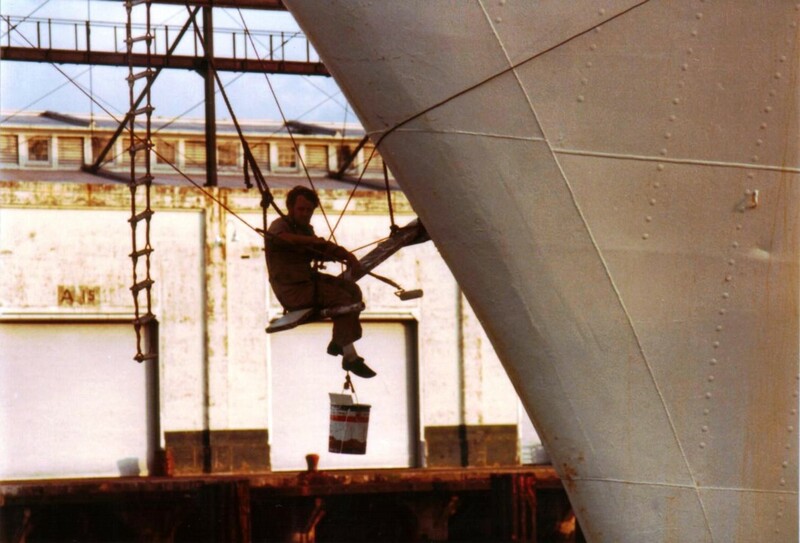 This crew member descended to his pendent plank on a rope ladder from the prow. This young crew member from Greenland was Danish-speaking and a huge fan of Elvis Presley. He paid a tribute to his idol whenever he got an opportunity – Vegas style – like here, at a crew evening in Kungsholm’s cafeteria on C-deck. 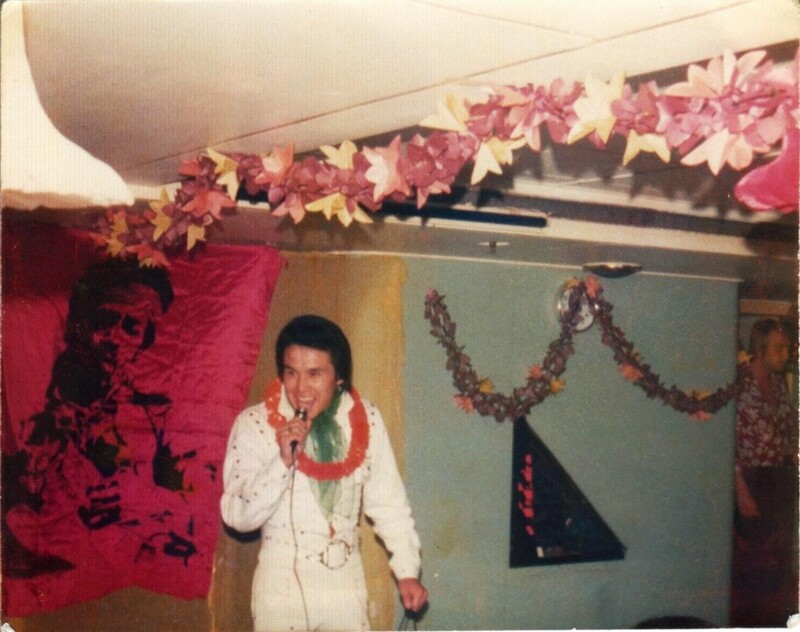 The crew member ”Elvis” from Greenland has identified himself as Bendt Knudsen, and he worked onboard 1973-75 mainly in the bar section on Verandah deck.